My brother Duncan and I, unmarried and still living with our parents, decided to take the opportunity to shoot together. The opening day fell on a Saturday and neither of us had to go in to work. Through the silence and darkness of the early morning we cycled to Coates and our Uncle’s Feldale Farm where we arrived at 4.15am. It had been arranged that we would be coming so we pedalled past the sleeping household, luckily without the dog hearing the rattle of our bikes. It wouldn’t have bothered Uncle overmuch if he had heard us, as he would be up at 5am anyway, but our Aunt might have had different ideas. We left the cycles in the open-ended implement shed at the bottom yard and from there it was only a short walk to the Counter Drain, where our boats were moored. 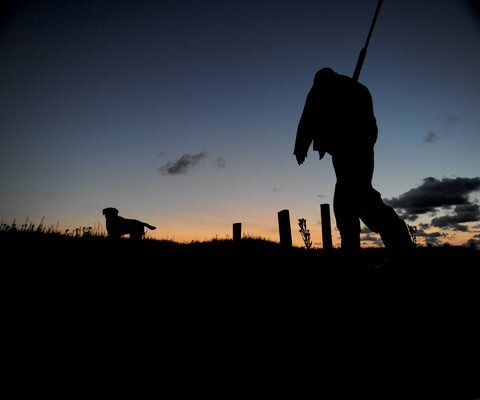 We loaded our guns and gear into Wigeon, the light fibreglass boat and crossed the drain to the Pumping Station. Much of the Fenland is below sea level and the land is kept dry by Internal Drainage Boards (IDBs) who are responsible for draining their own district. Each field has its own dykes, from which surplus water runs into larger drains. Every district has at least one pumping station that transfers the water from the drain into a main river. 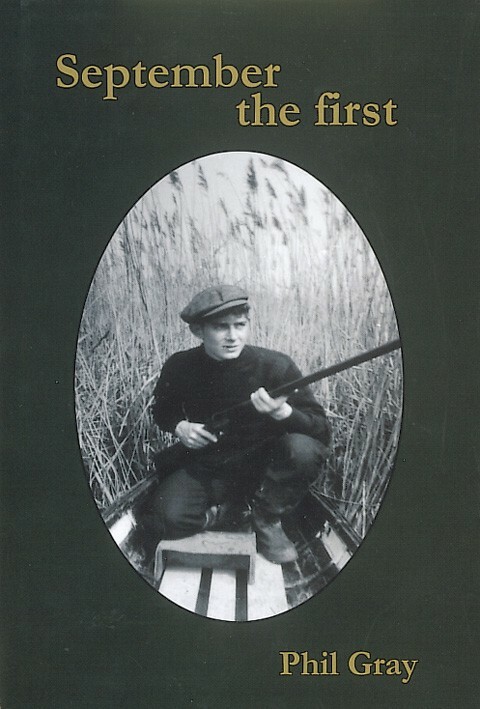 This extract of September the first covers the opening day of the wildfowling season on the Cambridgeshire fens in 1962. The IDBs quietly carry out their duties year in year out and many residents do not realise that it is only through the vigilance of their local Board that their feet are kept above water. On this morning we ‘sledged’ everything over the bank until the boat slipped into the cold waters of Morton’s Leam (a water channel). It was the matter of a few moments then to ferry ourselves over the Leam and into one of the dykes in the Wash.
From that point on the procedure followed that of a ‘normal’ first morning. We separated and quickly hollowed out hides in the rushes and settled to the long wait. It was still dark and a thick ground mist didn’t aid visibility. It was probably the mist that was causing a bullock to cough and wheeze asthmatically not so very far away. I had almost finished the last dregs of hot, sweet black coffee from my vacuum flask and was gazing at the gradually lightening sky. There were signs and faint sounds of the world waking up. It was time to be prepared as the Scouts motto proclaims. I drained the coffee cup and after checking that my gun barrels were clear of any obstruction, slipped a couple of Grand Prix No.5s into the chambers. They would cope with anything that came this early on. No sooner had that thought crossed my mind than … Ssssswooosh! A team of mallard whizzed over from behind. So clear were the silhouettes that I could easily see there were seven duck. I even got in a snapshot at the fast disappearing shapes, but without effect. Naturally, this incident woke us up, sharpening our senses to listen intently for the slightest hint of approaching fowl. Again I heard the hiss of rapidly beating wings and looked around, searching the sky. From behind me about 14 mallard were passing, not 10 feet up. I fired hurriedly and missed again. 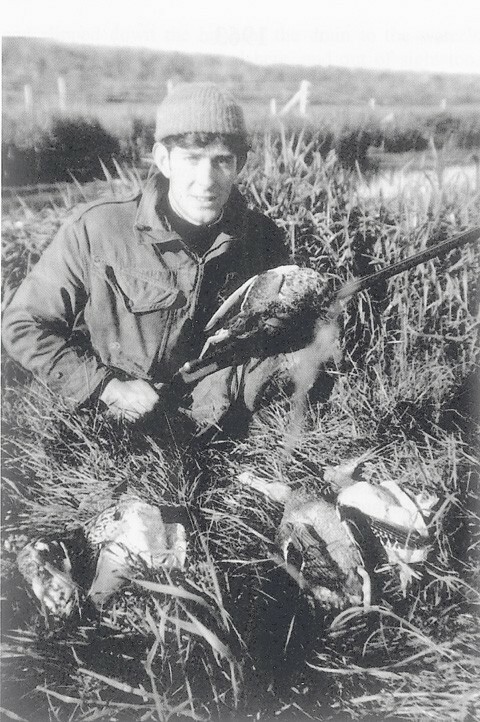 As they climbed however, Duncan’s 20 bore cracked and one of the ducks folded to crash on the far side of the river. I nipped down to the boat and paddled over to make the retrieve. I found it easily enough, a mallard duck lying on its back on the bank a few feet from the water’s edge. On my return I congratulated my brother on his fine shot and very first duck. No matter how many he puts in the bag from now on, he will always remember that one. The author on Whittlesey Wash in 1962. Not long after we had settled down again, a single duck flew over and I saluted it with both barrels. It faltered and went into a long glide. I watched, ready to mark it down as accurately as I could, but just before the bird vanished into the gloom there was a shot and the duck fell. There was a lull until it became fully light, although there was a splutter of shots from the New-Come-Over drain at regular intervals. I increased the bag when I shot a passing snipe and then a golden plover. Odd parties of duck travelled up and down, but naturally they had not been long in discovering that it was wise to gain some altitude. One mallard thought he had found a quiet spot when he pitched in to our dyke, 200 yards down from us. I noted a particular clump of rushes near the place he went in and proceeded to stalk, keeping my eyes on the clump. Things went without a hitch and I added an easy duck to our total, but success is not always a foregone conclusion. Birds can swim away as soon as they pitch, or they can glide along out of sight, so that when the confident stalker peers over the brink his quarry gets up 70 yards further on. I walked back to my place in the rushes and enjoyed a pleasant half hour soaking up the warmth of the sun. It was still low in the sky, but had already dispersed the mist and we could see other fowlers here and there. Some were standing up for a stretch after the long spell of kneeling in thigh boots. Others stood talking and having a smoke. A trio behind us suddenly dived for cover and I scanned the horizon expecting to see a team of duck. Then I heard curlew calling. I couldn’t see them, but decided to call them. Now I spotted them and they were definitely responding to my whistle. There were four birds and as they passed to the left of me, I fired a couple of shots. One bird parted company with the group and went down beyond the bank. Duncan went over in the boat and disappeared over the river wall. He returned after several minutes, empty-handed. We resolved to have a better search on our way home. The front cover of September the first. Duncan decided to move to the other side of me in case more curlew followed the line of the first group. I thought it was merely chance that brought them on that line, but I didn’t interfere. If he felt happier by moving, fair enough. He certainly must have felt that his decision was justified a little while later when we heard curlew voices once more and again I began calling. There were 12 in the herd in an extended line formation, looking almost like gulls, but with faster wing beats. They were almost on the same line too, but crossed our dyke well beyond Duncan’s new hide. I gave another call that had an instant reaction. The 12 banked round in a wide circle and flew back towards us. The low sun was behind us now and every bird showed clear cut against the sky as they came right over and between us. I saw my brother’s bird collapse and fall as I swung through mine, which also folded. They bumped onto the grass simultaneously. We both missed with our second shots and the remaining curlews flew off, shrieking their complaints to all and sundry. Just before 9am we ferried ourselves over the two waterways to the moorings, having first renewed our search for the lost curlew. The slamp, which is the local name for the level ground at the base of the bank, was sheep grazed and it would have been easy to see a dead bird lying there, so we came to the conclusion that the bird must have fallen into the thick reed shoals in the Counter Drain. Without a dog our chances of finding anything in there were nigh on impossible. At the moorings, I shot a redshank that came whizzing along the brink. We picked him and made our way to recover our cycles from the farm buildings. It was warm now and we biked up to the house, where our Aunt soon produced cool drinks. Leaving our birds in her custody, we finished the morning by walking up a nearby potato field. There were no coveys awaiting us today, but one red-legged partridge was flushed and that fell to my shot. So ended an interesting morning’s sport, with a very mixed bag and of course, a big day for Duncan with his first duck. Copies of September the first, which is a collection of opening day diary entries from 1958-2010, can be ordered from Phil Gray, 33 Bellamy Road, Oundle, Peterborough, PE8 4NE. The cost of September the first is £23 which includes postage and packaging and cheques should be made payable to PS Gray.